They are unhindered by what they are supposed to be. They don't have cutesy, endearing names given to them by their owners. They are not owned. They aren't caged in by fences, gates, or barns. 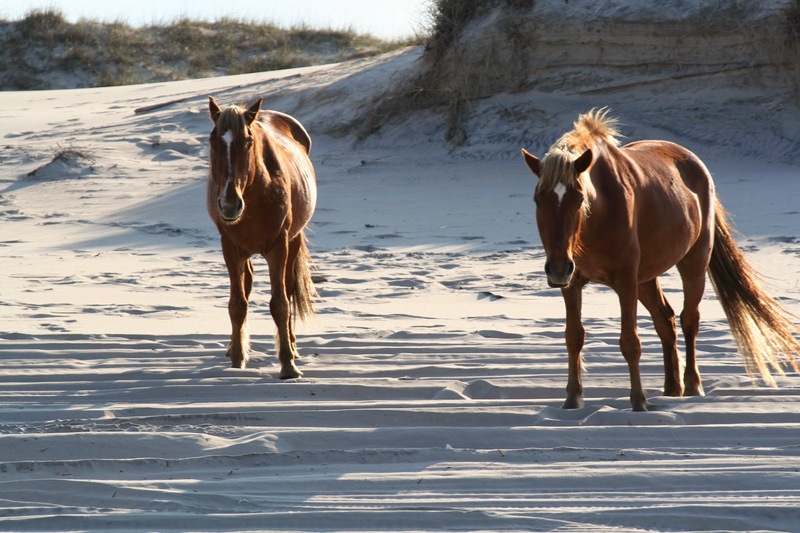 They aren't forced to eat a particular diet, wear saddles, or be trained by professionals. Instead, they are deemed wild. They eat from the land. 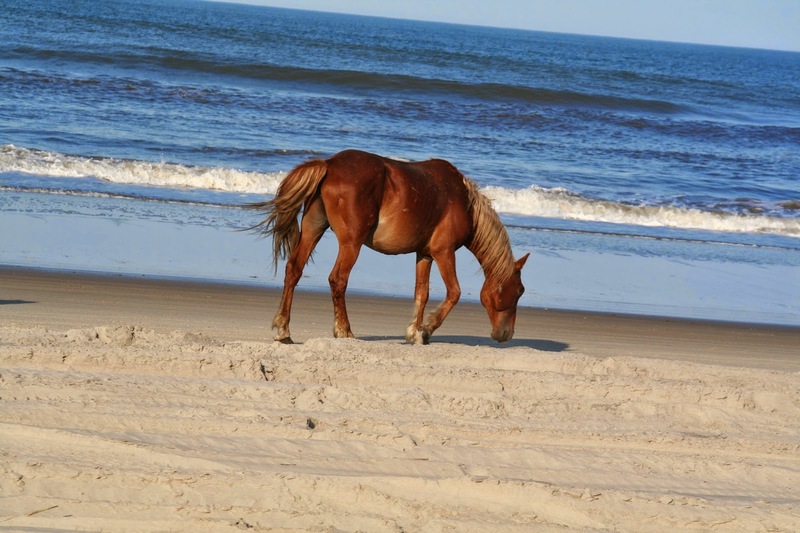 They enjoy water and sand and grass. They run. In essence, they are free. 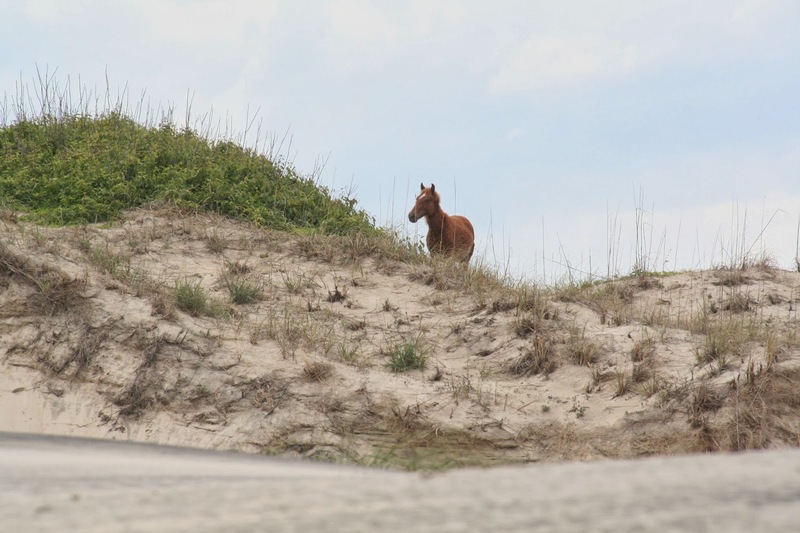 When we first saw the wild horses while vacationing in The Outer Banks, we were in awe. There they were, right in front of us. They gazed at us with confidence and grace. I am not an animal lover by any means. But I was bathed in the utmost respect for these animals. Seeing them is unforgettable. I want for my children what every parent seems to claim. We tell our kids: You can be anything. You can do anything you set your mind to. The world is full of endless possibilities. We encourage them to dream by asking, "What do you want to be when you grow up?" My three-year-old says: an alligator. My five-year-old says: a teacher, a police officer, and an artist. They are young enough, happy enough, and imaginative enough to feel that anything (and everything---perhaps having three careers or one career as an animal---huh?) is obtainable. 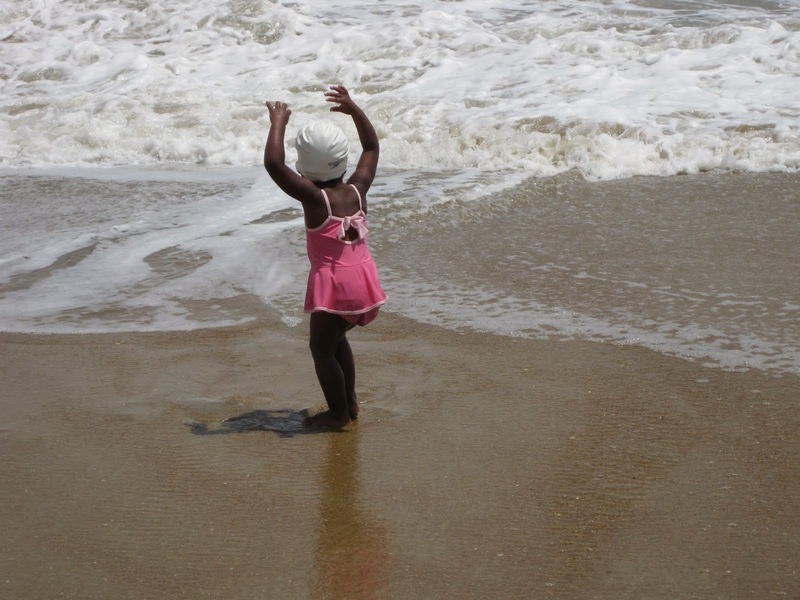 When my daughter was a little over two, she became obsessed with owning a pair of swim trunks. Recent playdates with friends and cousins, all of whom were boys, piqued her interest. The trunks the boys wore were graphic and colorful. And they didn't dig into (or slip off) her shoulders like annoying girl swimsuits. So one afternoon, we're at Gymboree, and my daughter fixates on a pair of blue pirate swim trunks. As she's rubbing the fabric between her fingers, a store employee approaches us. All smiles, she dotes on Miss E, and then says, "I bet pink is your favorite color!" I try not to roll my eyes. I say, "Actually, she loves orange." Employee to my daughter: "Oh, you don't want those swim trunks! There are some cute swimsuits over here..."
Me: "She really wants a pair of swim trunks." I recall when Miss E started dance class. She LOVED to dance. At home. In stores. While waiting in a line. And people would remark, "Oh, she loves to dance!" Sometimes followed by, "It's in her. Black people are so good at dancing." It's in her? Some of my most eye-opening experiences with race and stereotypes came from my students. Throughout my nine years of teaching, I had several students share with me, in person or in writing, their experiences. One day after class, an African American student shared with me the story of a recent sorority party she was intending to attend. The them of the party was BET or CMT. My student was the only Black girl in her sorority, and she expressed her hurt to me when her sisters said, "Well, obviously you'll be going as BET." Another student of mine, an eccentric Black girl who loved funky earrings, rock band t-shirts, and bright-red lipstick, shared in class that she was tired of feeling like she had to fit into a particular mold because of her race. She said she's been made fun of for majoring in drama and for not being, in essence, Black enough. I'll never forget my first semester of teaching. I read a paper written by a Black female who shared her lack of fitting in with others in her neighborhood. She wrote that she was often referred to as "Oreo" (Black on the outside, White on the inside) for her love of reading, for attending college, and for "sounding White" when she spoke. But the ostracizing often doesn't begin and end in the same place. Students would find themselves disliked by one group and also disliked for the same reasons in another group. Some felt they weren't "enough" of one or the other, leaving them in constant limbo, uncertainty. They had to prove themselves to different people at different times, as if they were always on trial. Now, I know some of you are thinking "sticks and stones." We need to just reject words, be ourselves, love ourselves, and not care about what other people think. It's a great idea. But even the most confident of people sometimes let the questions, the assumptions, and looks get to them. And children, in particular, are so vulnerable, because they really are sponges, soaking up the good, the bad, and the oh-so-ugly, even when we parents work hard to protect them, instill confidence in them, and encourage them. My girls are yoga fans. Their former nanny is a yoga teacher and got Miss E hooked. Then Miss E got Baby E to do poses. Then I bought them yoga cards which further inspired them to practice. Then in January, some White chick with some sort of personal complex about herself and people of other races, decided to write a blog post that spoke volumes. She infuriated many people (rightfully so) with her message. Look girls. Look to Misty Copeland. Look to female African American golfers. Venus and Serena. Gabby Douglas. We listen to all types of music here. The big band/swing station is fun when we're playing toys. We listen to contemporary Christian because the music is clean and the kids know the music from church. Nothing makes us move quite like Beyoncé. We love the authenticity and charm of Ella Fitzgerald. And we are also country music fans. I've introduced my kids to Darius Rucker and Rissi Palmer: both brown-skinned country artists. My son loves baby dolls. He kisses their faces, hugs them tight, stares into their eyes. (IKEA and Corolle and Alexander Dolls make African American boy dolls.) And his snowsuit, it's magenta. Like BRIGHT magenta. Because why would I go buy a brand new $30 snowsuit when he'll wear it like three times before outgrowing it and the season changes? My girls are huge fans of all-things-transportation. The louder, brighter, and more flashy, the better. The trash truck, school buses, and police cars are so fascinating that when the girls see them, they shriek in excitement. They also love construction sites, dinosaurs, and Superman. Yet, the "girl aisles" of stores are cluttered with princesses, purple/pink/glitter, dolls, and toy shopping carts. The issue doesn't end with what is available. There is so much lacking. So much omitted. Dark-skinned people in popular media. Positive representations of Black boys and men. Clothing for young girls that depicts messages of intelligence and drive. That they should rely upon society's belief of who they should be instead of on God's plan for them. Instead of loving their talents, exploring their worlds, making new friends, and relishing in new experiences, they should conform to a very small set of standards that secretly serve to hinder them, cage them in, and command them to submit. I have no idea yet what God has in store for my children, but I know one thing for certain: there is something in store. There is a plan. There is a path. And I pray as their mother that I am able to teach them discernment, guide them through rough patches, and encourage them to be the incredible person God has created them to be. And above all, I want them to know that when they are in relationship with Jesus, there is freedom.